Like our FACEBOOK PAGE for the latest updates on this storm! Hagupit (Bagyong Ruby) has rapidly intensified into a Category 5 Super Typhoon monster this morning. 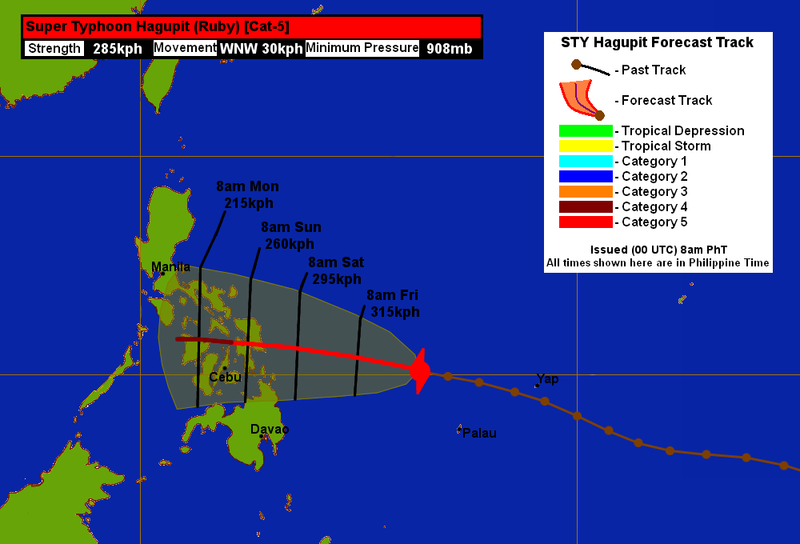 The eye of Hagupit was last located approximately 380km north northwest of Palau or about 770km east northeast of Surigao City. Maximum sustained winds are at 285kph with gusts of up to 350kph. Super Typhoon Hagupit is currently moving west northwestward at 30kph. As of 11am this morning, PAGASA has raised Public Storm Warning Signal #1 for Northern Samar, Eastern Samar, Samar, Biliran, Leyte, Southern Leyte, Surigao del Norte, Siargao Island, Surigao del Sur, and Dinagat. Residents are advised to pay close attention and always heed the warnings from your local officials! Latest satellite image shows the menacing eye of Hagupit becoming more and more symmetrical. The system underwent an eyewall replacement cycle last night and upon completion, has rocketed in terms of intensity. It will likely continue intensifying even more as it moves across the warm waters of the Philippine Sea. Since it still has at least 48 hours before moving towards the Philippines, there is a possibility of another eyewall replacement cycle which could weaken the system a little bit. Our forecast track remains consistent with the consensus among the computer models and forecast agencies in the region. Unfortunately, this track continues to paint a grim picture for the Philippines. Super Typhoon Hagupit could slam parts of Eastern Visayas at Category 5 intensity with winds of up to 300kph this weekend. Along with damaging winds, the threat of heavy rains and significant storm surge exists as well (as we've seen with Super Typhoon Haiyan or Yolanda last year). This is a very significant and dangerous cyclone and we urge everyone in the country to pay close attention to the forecasts and warnings from authorities! If you live along the coast and other storm-prone areas (especially in the Visayas), please start preparing now and consider the possibility of evacuating at a moment's notice. We have about 48 hours before the dangerous weather conditions will be slamming the country. We'll have another update later this afternoon. TS Nock-ten is finally moving away from the Philippine Islands. 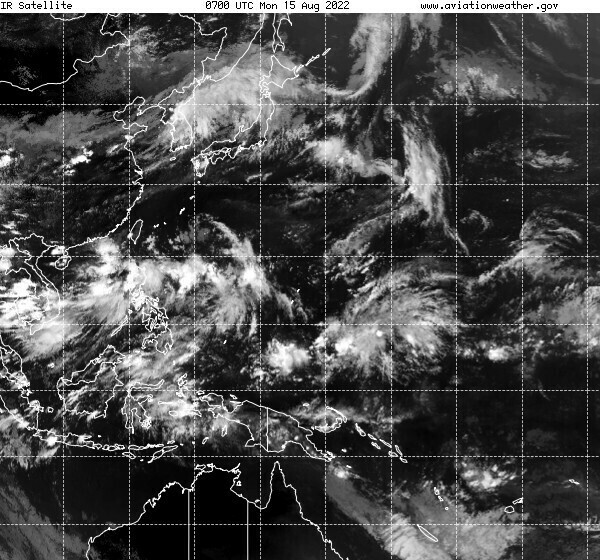 The system should continue to weaken as it moves across the South China Sea. Read our latest update for more info.